It’s been a while since I read a full-size coffee table book in which the dominant graphic elements match the quality of the relatively few pages of prose within it. 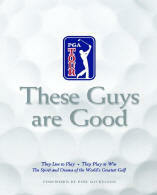 The PGA Tour folks achieved that elusive goal with this book. As I think about it, the title describes not only the Tour players it’s meant to praise, but also the team of photographers, writers, and editors whose joint efforts produced the book. For example, it uses perhaps the least amount of white space and the most double-paged, run-to-the-edges photographs I’ve ever seen. It’s simply visually stunning, especially the action shots of the Tour players. Think Sports Illustrated on steroids, or experiencing a Keanu Reeves moment every few pages (as in his penchant for saying “Whoa! !” in nearly every movie in which he’s appeared). The pictures of some of the famous tournament venues also frequently veer away from the familiar, and present several unique perspectives instead. For example, there’s a great shot of the 6th, 7th, and 8th holes at Pebble Beach from a spot near the 9th tee box, an interesting perspective that’s not often displayed. The essays and sidebar stories are well-done. Cullen contributed two essays, and the first one describes how the circumstances surrounding a particular shot define its quality, and not merely the technical brilliance applied in producing it. There are plenty of examples from past Tour history to prove that point, and the accompanying photographs fit his argument perfectly. Cullen’s second piece uses the Haas family’s multi-generational experience in professional golf to show how the standard of excellence on the Tour goes beyond the skills used in playing the game. Hauser’s essay uses examples from Tiger Woods, Mark O’Meara, Tom Lehman, and several other major tournament winners to describe the personal qualities of focus and perseverance that produced their victories. Barrett’s chapter is devoted to the variety of challenges presented by the golf courses of the Tour, emphasizing the startling differences in turf, design, and conditions. As this year’s U.S. Open proved, the players’ margin for error can have a remarkably thin edge, spread out among 110 acres or so. Soltau’s essay, “Reaching Beyond Limits,” focuses on the psychological elements of the game at this level. 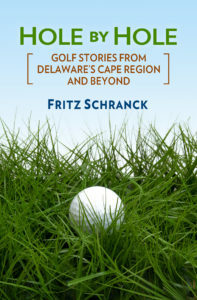 He uses the stories of Al Geiberger, Chip Beck, and David Duval’s rounds of 59 to describe what all players try to do—cope with the unmanageable elements of the game, while putting their own personal stamp on the quality of the final results. Golf is a popular subject for coffee table books because it is such a visually appealing sport. The folks who put this one together should be proud of the new standard they’ve set with this delightful addition to the genre.